This product will be in stock on Tuesday 18 February, 2020. 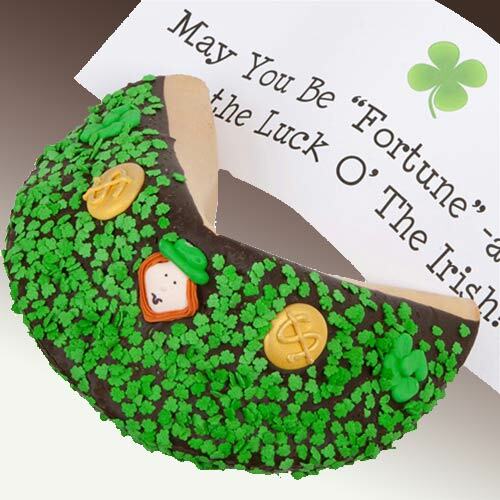 Our delicious Giant Fortune Cookie is hand-dipped in your choice of fine Belgian Chocolates- Dark, Milk or White- or rich golden Caramel- it's almost the size of a football and contains a 1-ft-long fortune with your personalized message inside. (250 character limit) Embellished with adorable hand-crafted Royal Icing Decorations, and assorted Non-Pariels and Shamrock Sprinkles, each cookie is beautifully wrapped in a gusseted cellophane bag and tied with a wire edged Ribbon to match.